Announcing The Kiddo Feedo Feeding Bib – The Smart, Safe and Simple Way to Feed Your Baby at Mealtime. Made with 100% natural, eco-friendly silicone our bibs contain no BPA’s, phthalates or other nasty toxins, putting your child’s health and the environment first. The soft, flexible and lightweight bibs provide extreme comfort and the adjustable straps ensure a snug fit around the neck. The bibs are shaped to conform to the curvature of the chest, allowing the bib to lay naturally against the body. Suitable from ages 6 months to 3yrs. Designed with a large, wide pocket that stays open to catch falling food and liquid means less stains and mess on the table, floor and on your child’s clothes. The bibs are naturally waterproof and stain resistant, preventing any mess from being soaked up. Washing them is easy – no more soaking to get rid of nasty stains or several laundry cycles. Just wipe clean, wash in warm soapy water and if they’re very dirty, put them on the top rack of the dishwasher. Our bibs can be easily rolled up to save space when storing at home or in your diaper bag so days out mean more fun and less mess. Just roll up the bibs and they’ll contain most of the mess until they can be washed. At Kiddo Feedo we’re all about fun, mess free and stress free eating. We’re confident that you’re going to love our bibs and are committed to our customer’s satisfaction so therefore offer a Money-Back Guarantee and a Lifetime Warranty.BIBS THAT ARE 100% SAFE – Designed with love in Sweden, our pretty, eco-friendly weaning bibs are made of FDA-approved premium quality food-grade silicone which is naturally non-toxic and free of any BPA’s, phthalates, PVC, lead, nitrosamines putting your child’s health and the environment first. ANTI-BACTERIAL & EASY TO CLEAN – our waterproof and fast-drying bibs are naturally anti-bacterial, hypo-allergenic and sterilized and are easily cleaned in either warm soapy water or in the top rack of the dishwasher. Given the silicone material, the bibs also won’t gain any scuffs and scratches over time like plastic bibs. GROWS WITH YOUR CHILD – With an easy to adjust strap the bibs are suitable for infants aged 6 months to toddlers aged 3, making them easy to put on and remove. 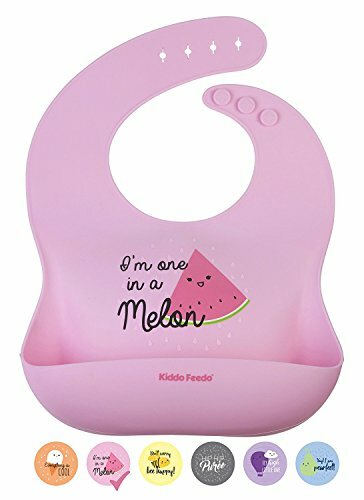 The comfortable straps with the large neck radius and the slim but durable design will help (rather than restrict) your child’s movement during feeding. WIDE CRUMB CATCHER THAT STAYS OPEN – Designed with a deep and wide crumb catcher to catch falling food and drink spills, the crumb catcher stays open and will keep its shape at all times, resulting in less stains and messes on your child’s clothing, the table and on the floor. EASY ROLL UP AND GO – Our portable, easy-to-carry bibs can be quickly folded or rolled up to save space and put into any bag for travel, restaurant visits, parties or any day out, helping all busy parents on the move.